Tens of thousands of protesters converged on Sudan’s ministry of Defence on Saturday 6 April, demanding that the army step in to remove dictator Omar el-Bashir from power. In a dramatic escalation of the mass movement which has gripped the country with regular demonstrations since December 2018, protesters camped out in the streets around the Ministry on Sunday and Monday, despite attempts by the police to break up the sit-in. According to Sara Abdelgalil, spokeswoman for the Sudan Professionals Association, a soldier was killed while trying to protect protesters from the police attack. News that the protesters had reached the Ministry of Defence was greeted with cheers on a major rally organised by Sudanese activists in London on Saturday – although chants against military rule were also echoed by many in the crowd. 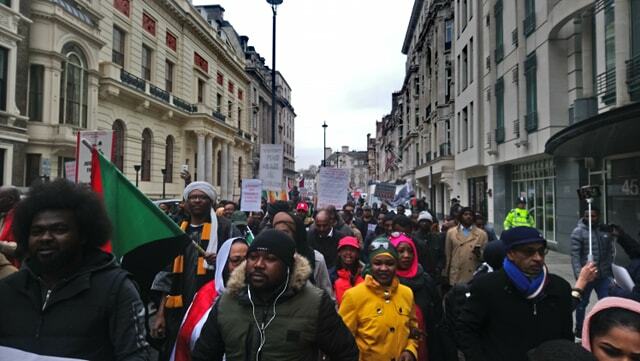 Thousands of Sudanese from across the UK had marched from the Sudanese Embassy to Downing Street to hear speeches and hand in a petition. Call on your MP to show their support for the protesters’ demands for democratic change in Sudan. Take a picture in solidarity with the Sudanese uprising using this sign [sudan_solidarity_poster] and share on social media using the hashtag #تسقط_بسPlease mention @MENAsolidarity so we can share further. Follow reports from Sudan on #SudanUprising and #SudanProtests. April 8, 2019 in Sudan.